Objective: To accomplish the comparative analysis of clinical features and laboratory findings in Helicobacter Pylori positive and negative patients with Immune thrombocytopenia. 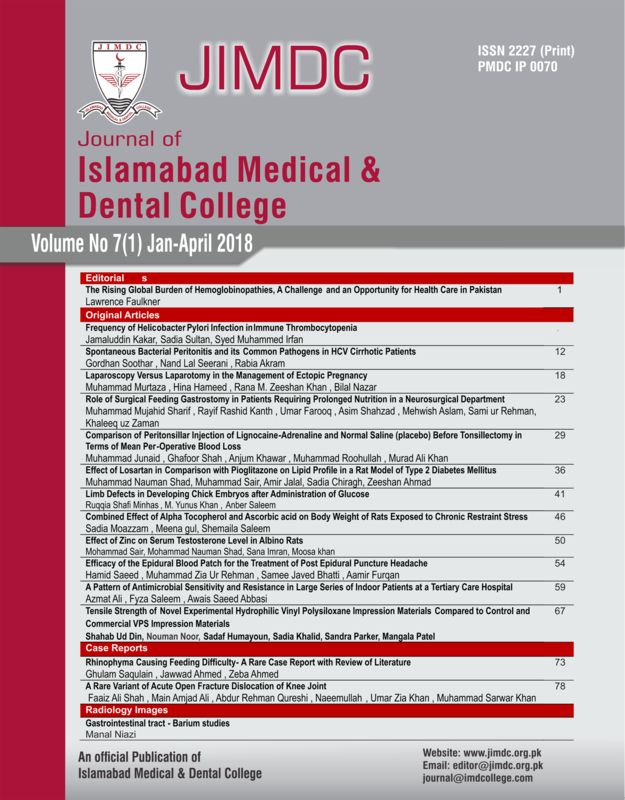 Patients and Methods: This cross sectional study was conducted from May 2013 to Nov 2014 at Hematology Unit, Liaquat National Hospital, Karachi. During the study duration, 59 adult patients, diagnosed as chronic immune thrombocytopenia were enrolled in the study. Helicobacter Pylori infection was documented by Helicobacter pylori stool antigen (HpSA) enzyme immunoassay method (EIA). Frequencies were calculated. Chi-square test and independent sample t test were used for comparison. P-value of less than 0.05 was considered statistically significant. Results: Helicobacter Pylori infection was detected in 25 out of 59 cases of chronic immune thrombocytopenia. No statistically significant differences were seen in H-Pylori positive and negative patients with respect to clinical features and laboratory findings except mean platelet count, which was lower (57.95±15.1) in Helicobacter Pylori negative as compared to positive patients (71.44±18.8). Conclusion: We found no significant difference between the clinical and laboratory attributes in H Pylori positive and negative cases. Significant finding of high platelet count in Helicobacter Pylori positive patients, may perhaps narrate the possible association.